Senator John McCain returned to the Senate yesterday to cast a crucial vote in the on-going process to try to improve our nation’s failing health care system. 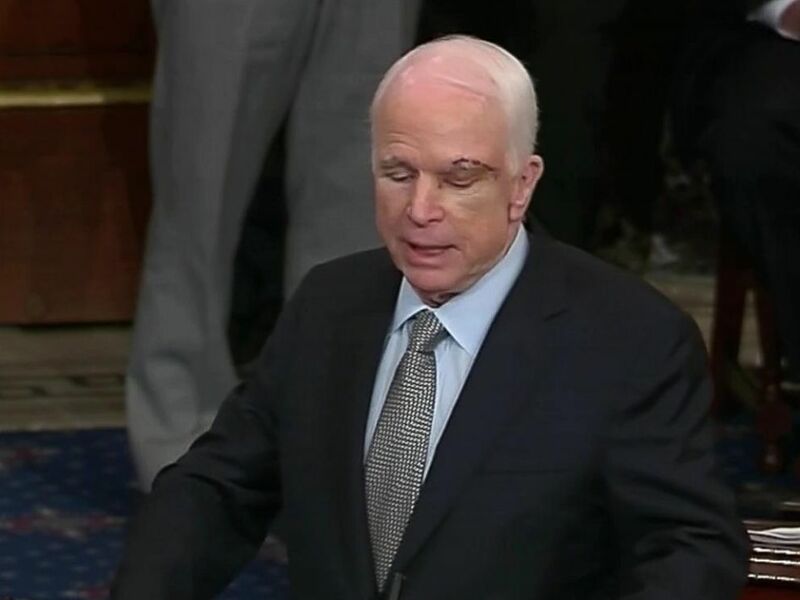 This was McCain’s first appearance in the Senate since his recent surgery and subsequent diagnosis of brain cancer. The maverick Senator was given a hero’s welcome when he returned to the Senate floor. Republicans and Democrats alike applauded and whooped as they greeted their ailing colleague. McCain was the recipient of many hugs and handshakes from both sides of the aisle. What is it about John McCain that could bring the Senators together in such a rare show of unity? In a word—sacrifice. McCain’s well-documented service to his country—which included years of suffering as a prisoner of war—have won the hearts of Americans across the political spectrum. Those who sacrifice so much earn our respect and devotion. This is the same quality that makes Jesus so beloved by so many people. The fact that Jesus would sacrifice his innocent life to pay for our sins is an attractive story. Jesus himself says, “And I, when I am lifted up from the earth, will draw all people to myself.” (John 12:32). The crucified Jesus certainly has drawn a lot of people to himself. That is the power of sacrifice. “Greater love has no one than this: to lay down one’s life for one’s friends.”—John 15:13. This entry was posted in Christian Living, Communion Meditations, Current Events, Leadership and tagged health care vote, Jesus died for our sins, John 12:32, John 15:13, John McCain, sacrifice. Bookmark the permalink.